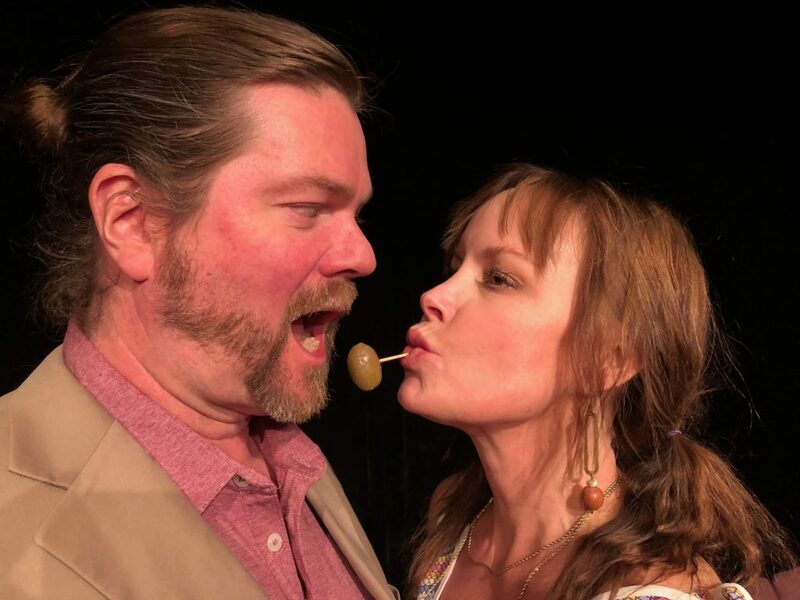 It’s malicious fun to watch two couples heading toward “total collapse” in Steve Martin’s Meteor Shower, FUSION Theatre Company’s latest production now running at The Cell Theatre (and later at the KiMo). It’s definitely more fun than hosting them yourself. As in Yasmina Reza’s God of Carnage, we get to sit back and watch the explosions and implosions with guilty pleasure. 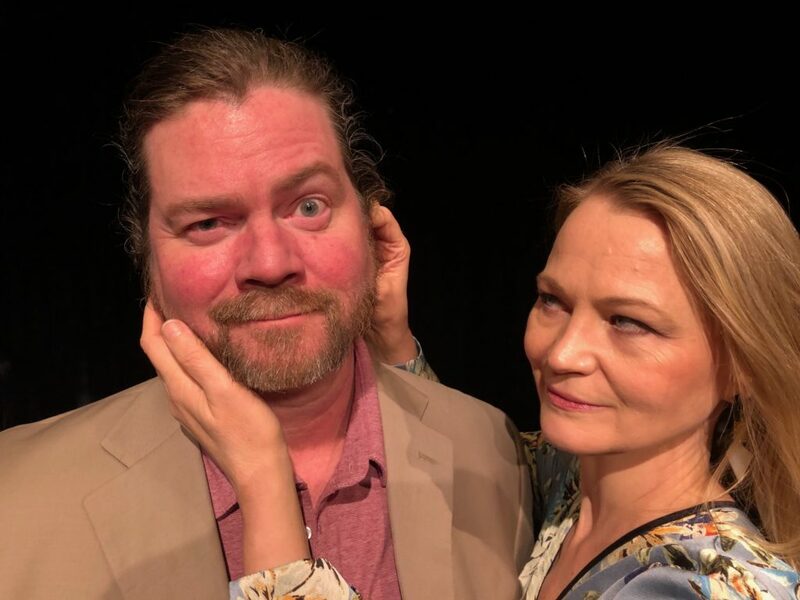 A married couple, Norm (Bruce Holmes) and Corky (Jacqueline Reid), have invited city dwellers Gerald (Matt K. Miller) and Laura (Celia Schaefer) to their home in Ojai, where the night sky is free-ish of light pollution and they can all watch the predicted meteor shower. Through a series of scenes, we spy on both couples before and during the main event. Scenes are replayed, with new perspectives and actions, culminating in one extended stretch that satisfies our itch for revenge. Steve Martin knows these people well, but he doesn’t like them very much. Although it is clear in the end that one couple wins all, throughout the play he mocks both marriages. Never invite him to a party at your place. Like Truman Capote, he’ll turn around and bite the hand that feeds him hors d’oeuvres. There are laughs aplenty as Gerald and Laura turn out to be the guests from Hell. California actor Miller groks Gerald; a consummate character actor, he becomes that obnoxious guy, helped along by crazy-perfect clothes courtesy of Costume Designer Ashley Miller. Schaefer, an actor from New York, finds nuances in Laura: she is haughty and confident until she becomes threatened and insecure. Watch the interim emotions flit across her face like starlight. Holmes and Reid have acted together many times and their present roles as Norm and Corky benefit from that longtime collaboration. They are at ease with each other yet intermittently combative, making us believe they are truly married. Their marital therapy exercises are hilarious and spot on. Scenic and Lighting Designer Richard K. Hogle gets it right in a crucial role himself, and presents a set that functions well and looks the part. As usual, Sound Designer Brent Stevens sets the scene for us with atmospheric songs and sly lyrics. The play itself is Southern California to its core—winking, nodding, and peppered with Martin’s signature corny jokes and harebrained situations. It’s like West Coast noir, in bright sunlight. Or in the flash of a meteor. ROBB ANTHONY SISNEROS is excited to return for his 16th project at The Cell Theatre including last season’s The Moors and The Miracle of Ballydonal, six of “The Seven” productions, and The Reindeer Monologues, I Love You – You’re Perfect – Now Change, The Last 5 Years, Mr. Paradise, Boston Marriage and The 39 Steps. A Bernalillo native, Robb received a Musical Theatre BFA from the College of Santa Fe. He has also produced/directed Buyer & Cellar and Sordid Lives as Matachine Productions. Photos courtesy of FUSION Theatre Company. Large photo above: Bruce Holmes and Jacqueline Reid. 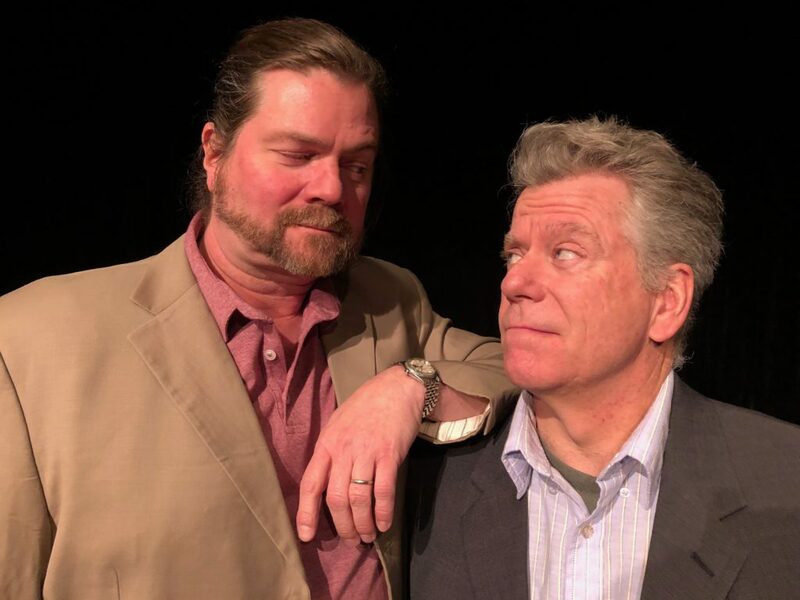 Above left: Bruce Holmes and Matt K. Miller. Above right: Bruce Holmes and Celia Schaefer.